From the back cover: In this album, both standards and originals by Gene Roland are presented in the colorful Latin tempos that the band plays for dancers. The outstanding arrangements by Gene Roland offer a deft, tropical approach to the traditional Kenton sound. 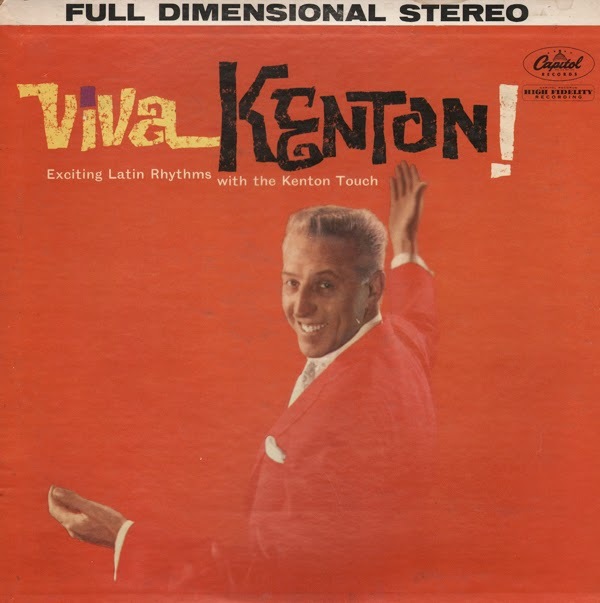 From February 15, 1960 Billboard: Kenton serves up some exciting, swinging ork treatments of Latin standards and originals – all tasteful, stirring Latin tempos. 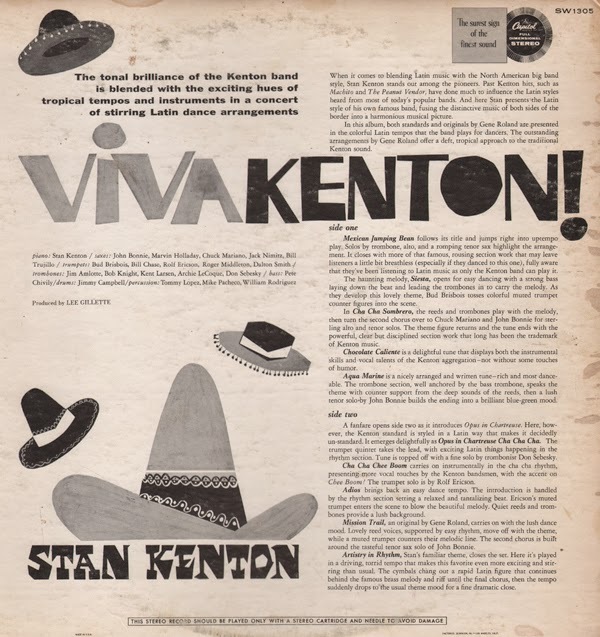 Line-up includes "Adio" "Artistry In Rhythm," (Kenton's theme), "Mexican Jumping Bean," etc. Fine Sound. Available from the usual online vendors, so I will not be posting a sample. Shared because this album could be my favorite mid-50s vocal set. London was an amazing talent and this album features one of her most stunning covers. The set seems conceptually "risky" for a "pop" album (just London and Viola working together), but the results work so well and will engage you all the way through. What makes the set even more amazing, by today's standards, is that the music was recorded before auto-tuning, and digital editing. This is just London and Viola making extremely soft, intimate music, perfect, with no editing. From the back cover: It's remarkable when you realized that Julie has such a paradoxical appeal. She seems to capture everyone from the housewife to the severest jazz critic; from the rock-and-roll-loving teen ager to the modern-sound-craving college student. And this is the girl who sang professionally for the first time only a scant seven months ago! It's undeniable that Julie's voice is not a big voice. And she may have vocal coaches throwing their hands in the air as she defies many of their precious fundamentals. But the end result is something no vocal coach could ever teach. Warmth and heart and sensitivity are not to be learned from teachers. Al Viola is responsible for the imaginative guitar accompaniment you hear behind Julie's voice. 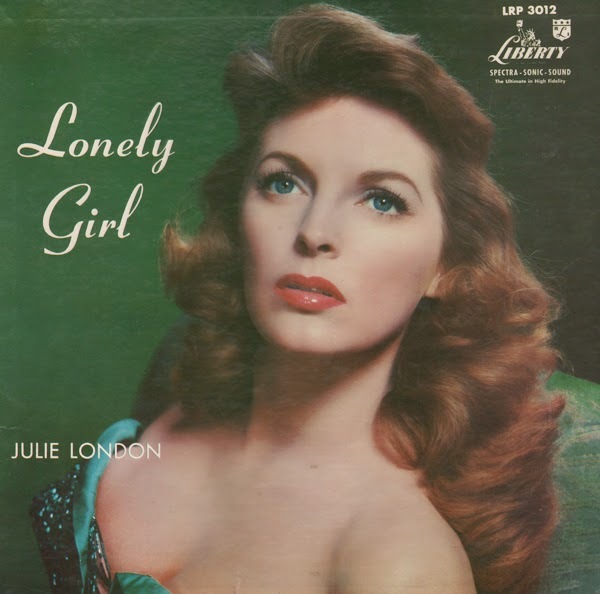 Just as Barney Kessel and Ray Leatherwood were such an important part of her first album, "Julie Is Her Name"; Al is certainly an integral part of the exciting mood created in "Lonely Girl". This may be one of the first times a gut-stringed Spanish guitar has been used in this way, and I think it makes for a tremendously interesting blend of voice and background. Al came to California via Brooklyn ten years ago and has progressed rapidly from he Page Cavanaugh Trio days to one of the most sought-after guitarists in Hollywood. Available from your usual online vendors, so I will not be posting a sample. 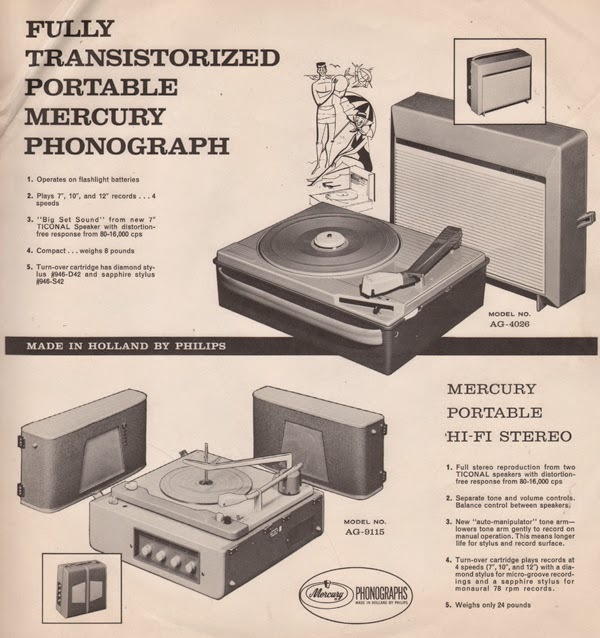 Shared because the copy I found still contains the original illustrated sleeve featuring an advertisement for a "portable" Mercury Phonograph made by Philips in Holland. The set itself is very good period Latin featuring a mix of a straight "big band" and more "space age" sounding tracks. "Zombie" sounds as if Arthur Lyman might have help record the tune. 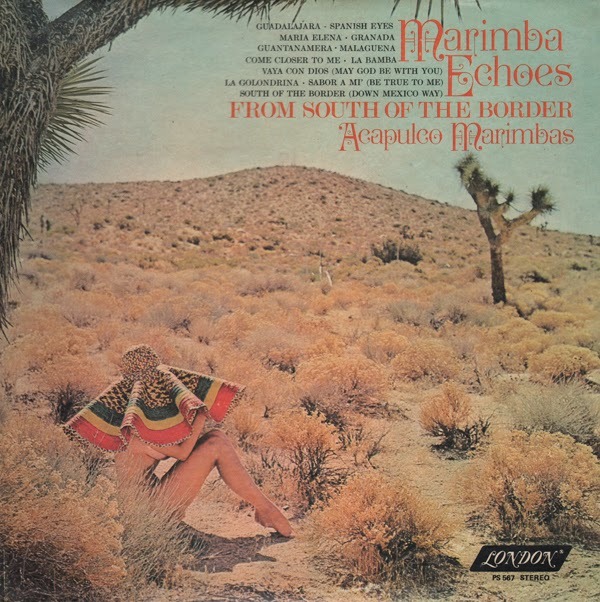 From October 12, 1963 Billboard: Cugi runs the gamut from "Cube Libre" (guaracha) to a "Singapore Sling" (rhumba) with tasty stops along the way to mambo, bossa, cha-cha, and so on. 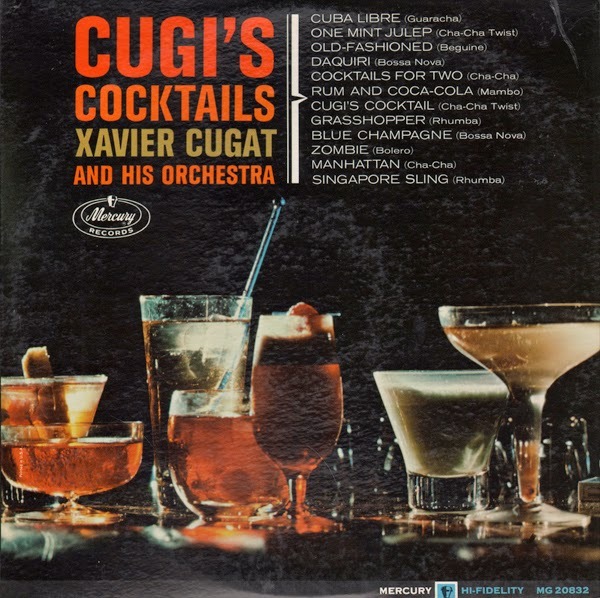 Cugi's Latin rhythm has long been a favorite among those who love to dance or just dream of far-away places. Best Tracks: "Manhattan" and "Blue Champagne." From the back cover: "Hommage à Heinrich Schütz," a choral work written in 1964, was inspired by study of motels by Schütz. The basic idea of the composition is the evolution from speech sounds to mixtures of sung tone organized vertically and horizontally, and back again to the wide spectrum of sound produced by whispering. Command styled set and book-fold jacket featuring the photos from the inside as seen above. The set consists of light jazz arrangements that struggle to find just the right blend between the brass section, the vibe of the original song and the solid straight up jazz passages that hold the project together. 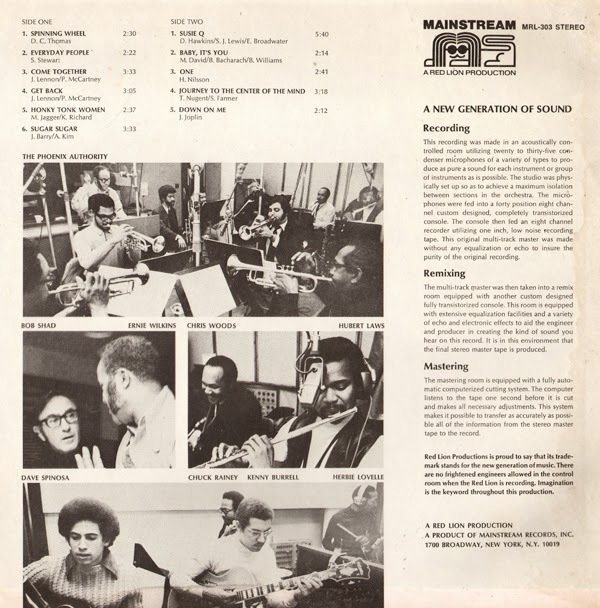 From the back cover: Seldom does a group of seven fine musicians get together at a recording session and hit it off with such a perfect blending of color and harmonies as heard in this album. 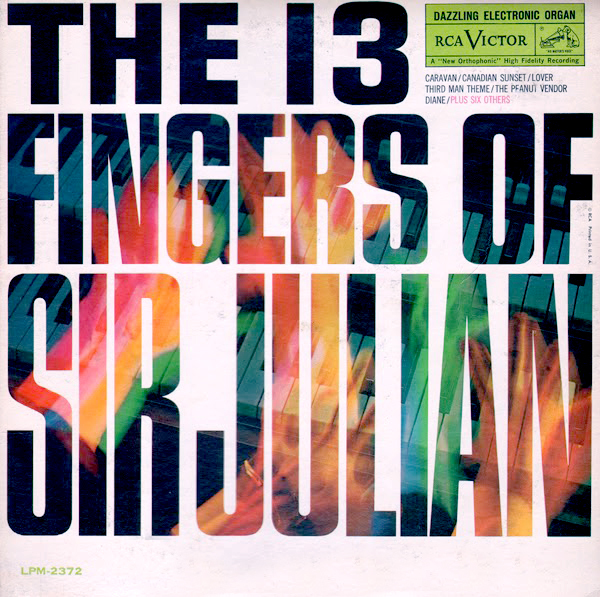 From the back cover: When you listen to Sir Julian play the organ, you'll be convinced he actually has been gifted with thirteen fingers. To be sure, all he has is the normal complement – eight fingers and two thumbs. But when he sits in at the organ, he plays like one possessed of a least three more fingers than is normal. 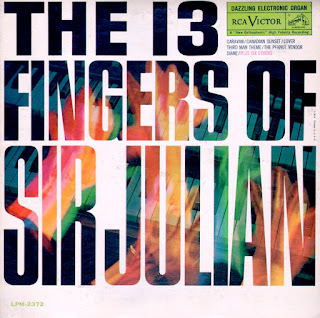 If the title of this album startles you, listen to The Thirteen Fingers of Sir Julian… and see what we mean. The three Sir Julian LPs I have in the collection are all fun plays. Julian arrangements are creative and feature just enough space age pop/jazz touches to keep me interested. I selected Canadian Sunset to share Julian's "jazz" vibe. From the back cover: I think Joan Toliver's native ability is very unique. This album was a tremendous change-over from what she had been doing. I (Jimmy Jones) gave very little indication of my musical intentions, but her reaction under pressure was great. It's talent of this sort that grows of its own beauty. The above back cover copy suggests that Toliver was thrown into the session with little preparation. Toliver's management should have sorted this one out before she signed to make this record. However, after reading the Billboard article (below), perhaps the approach wasn't completely unexpected by Toliver whose act, in 1965, was to preform a variety styles. Toliver does her best to interoperate "blues", "country", "pop" and "pop-rock". The results sound a bit "forced" on some tracks. However, we are offered a glimpse at what the album could have been if Jones, Toliver or her management had arranged a set based on this track (In The Name Of Love). A more blues/jazz orieneted album would have been thematically solid and very cool. Even the album title suggests that the producer didn't know how to market the set. 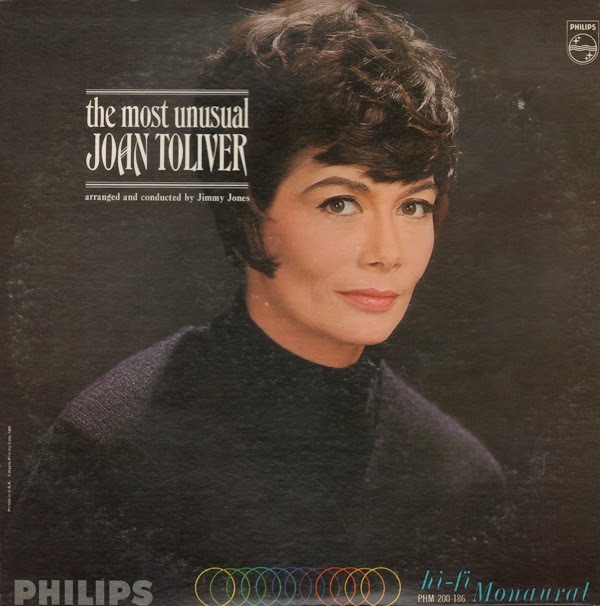 The Phillips art department understood the strength of the Toliver sound and provided an excellent cover that captures the best of Toliver's appeal. Information on Toliver is limited, but I found the below 1965 Billboard article/review written shortly after this album was released. The story suggests that Toliver came from a "folk"tradition. Exhibiting nothing of her folk formula of yore, Joan Toliver stepped off her opening show Wednesday night (29) at the Bitter End with a blues - feeling song "Squeeze Me." She was supported by a six-man band (the size of the group being an oddity for the Fred Weintraub nightclub) that was also very bluesy. In fact, her last album for Philips Records was blues oriented. But whether she sing folk songs or blues material, the packed nightclub was proof that she has a large and enthusiastic audience. "One Room Paradise," a good song sung with feeling and verve, was one of her best numbers of the night; it was polished and extremely commercial. 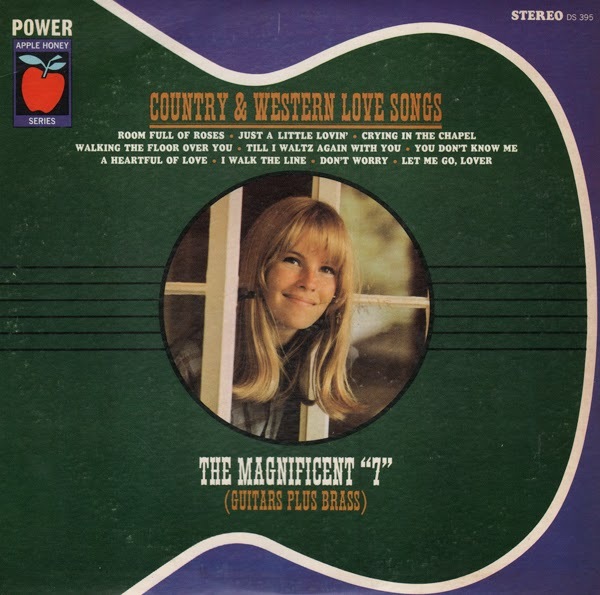 She put a lot of atmosphere of old New Orleans into "Old Rocking Chair's Got Me" and "Trouble In Mind". "I'm Traveling Light" was not only delivered excellently by Miss Toliver, but the flute trailing through the background made the song a standout. She closed with a very effective "Endlessly." Throughout the entire performance, she exhibited that husky voice her folk fans might remember, but it appears that a new Toliver has come on the scene. Why the "naked lady wearing the lamp shade"? Why not? This is a conservative set, especially for 1969. 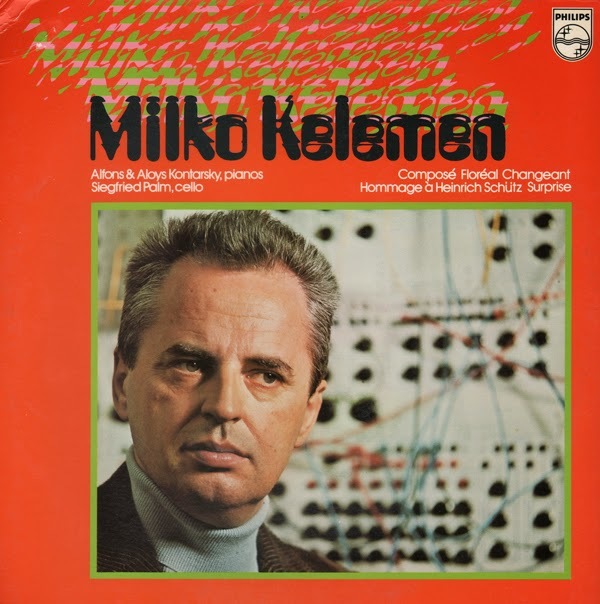 Traditional sounding approach, but featuring a few tunes arranged with pleasant space age orchestral passages. 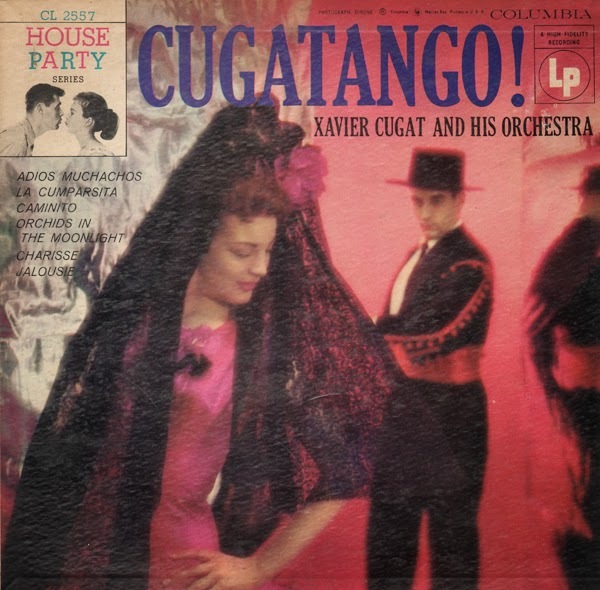 This early Cugat 6 track 10 inch LP lacks the energetic arrangements that Cugat would become known for later in his career. 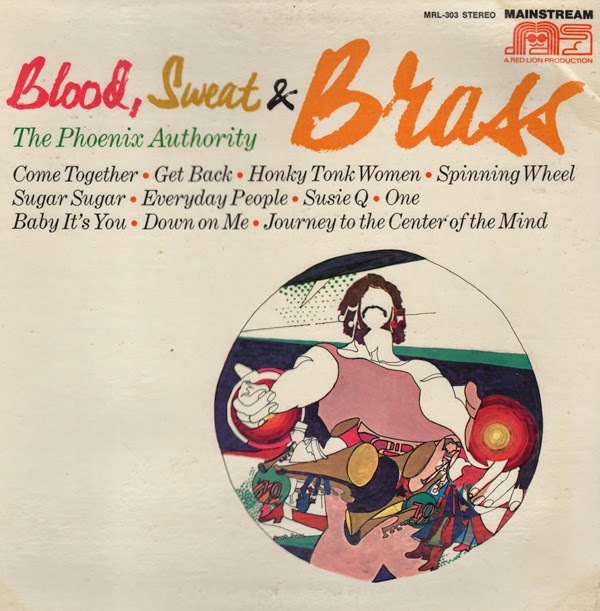 The set features instrumental tracks, with the exception of Bob Graham who makes a vocal appearance on the sample above, halfway into the tune.